My brother was over from Dubai at the beginning of May, and we met after work for a bite to eat. 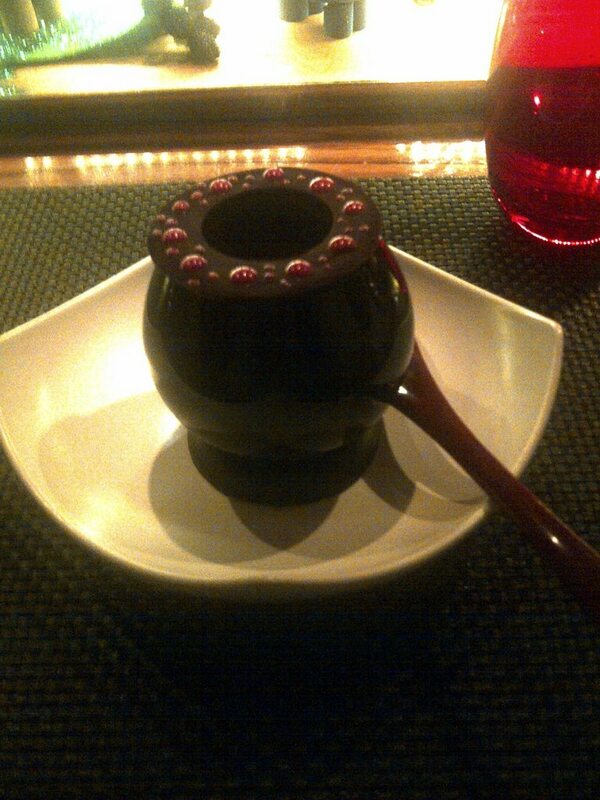 We originally planned something quick and informal, but decided something a little special was in order due to his infrequent visits, so we went to L'Atelier de Joël Robuchon, London. L'Atelier is the London outpost of the esteemed Joel Robuchon, and follows the format and design of a number of these outposts from Paris to Tokyo. This was my second visit, having visited earlier in the year. The restaurant is set up in 3 sections, a dining area based around the kitchen, a formal dining area and a bar/garden on the top floor. We sat at the bar area around the kitchen area, the best seats in the house as you can see all the dishes being cooked and assembled. The restaurant offers tasting plates, a la carte and tasting menus. We decided on spoiling ourselves, and chose the tasting menu. 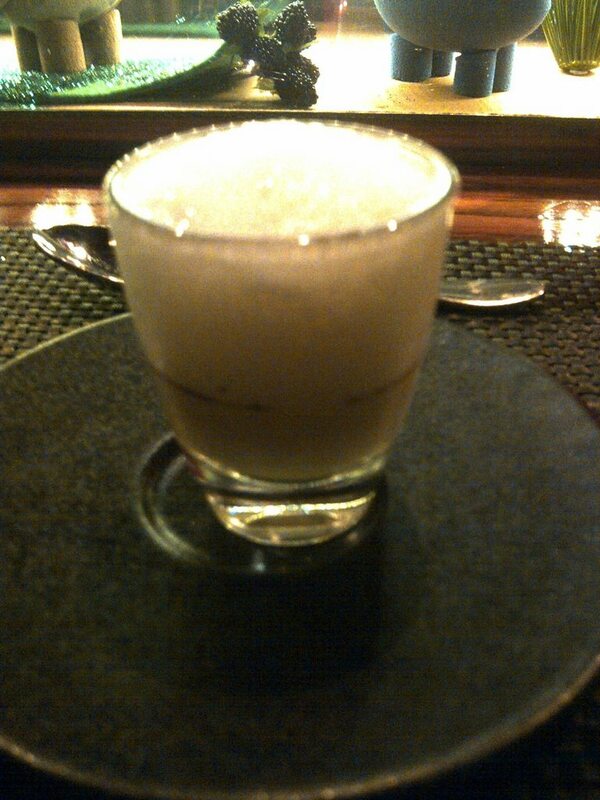 The amuse bouche was a shot glass of foie gras royale, a port reduction and fennel foam. The port reduction cut contrasted with the foie gras perfectly, with the fennel foam being aromatic and flavourful. First course was the reason I wanted to try the tasting menu, Robuchons signature Le Caviar dish. 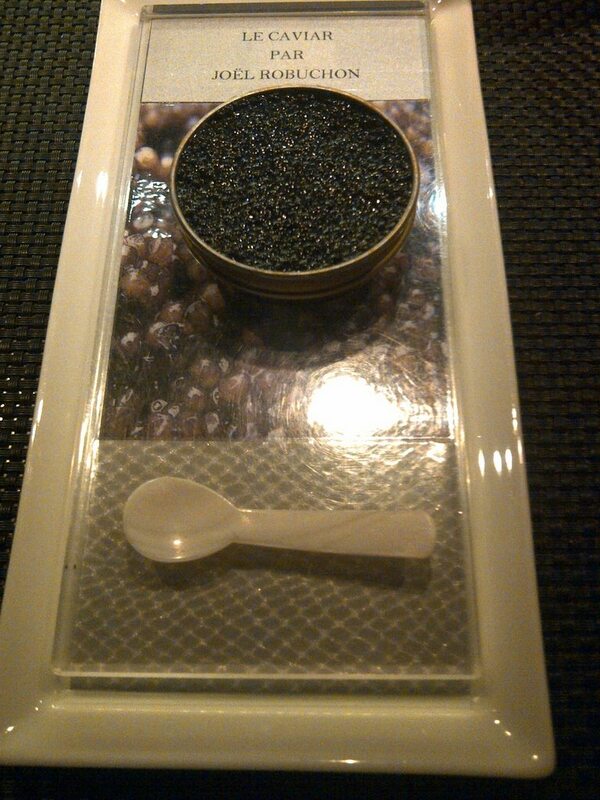 A tin was presented on a special dish labelled with Le Caviar par Joel Robuchon, along with a small mother of pearl spoon. Our waiters joked about if the chef was in a bad mood it might be boot polish! The lids were lifted to show a beautiful layer of caviar. Digging in revealed a base of crab and fennel cream. 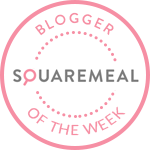 The saltiness of the caviar, the sweetness of crab and the delicate overlay of fennel was a surefire winner, and this might well be one of the my favourite dishes of all time. Next up was the scallop. 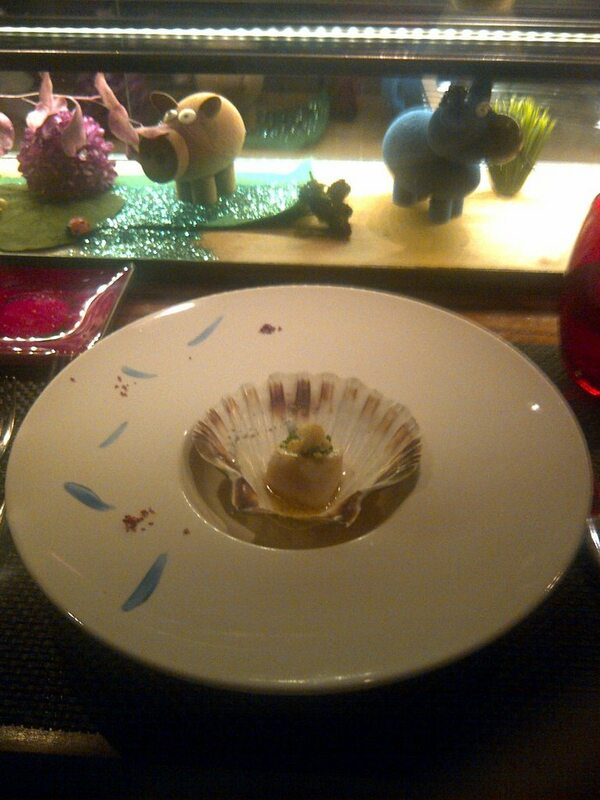 This was a single scallop presented in the shell, with a chive dressing. 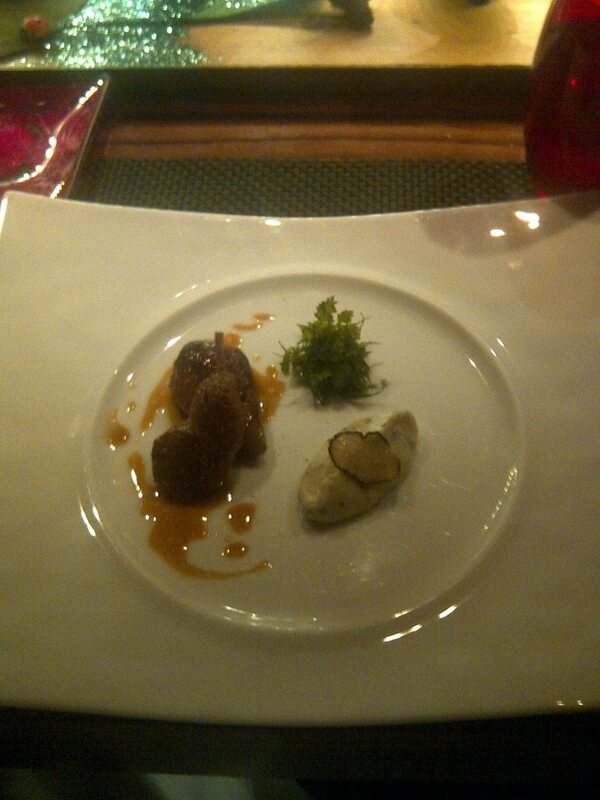 The scallop was perfectly cooked, plump and well flavoured, the dressing was a delicate Japanese like flavours. Following this we were presented with a bowl, with small onions, peas and bacon. A pea veloute was then poured on top. 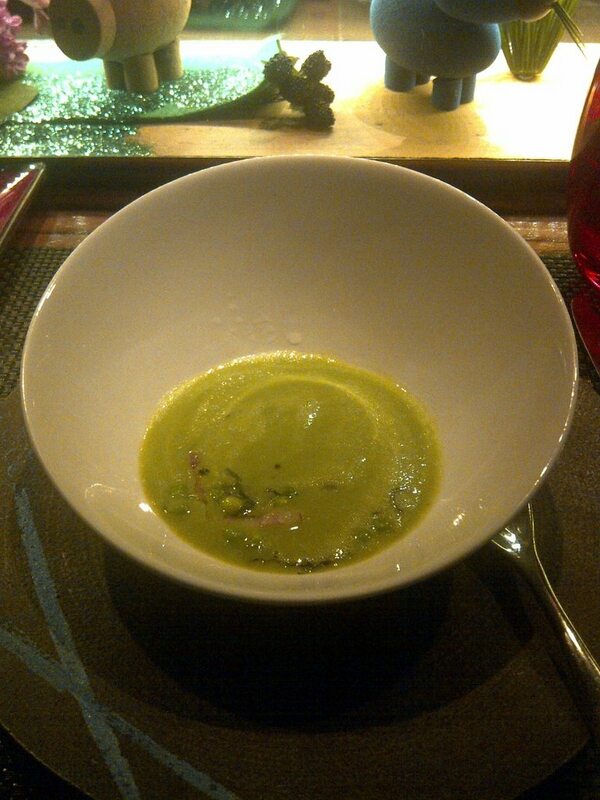 The veloute was intense, and the bacon was quite amazing, offering just the right saltiness to match the peas. I could have eaten a whole dish of the bacon alone. 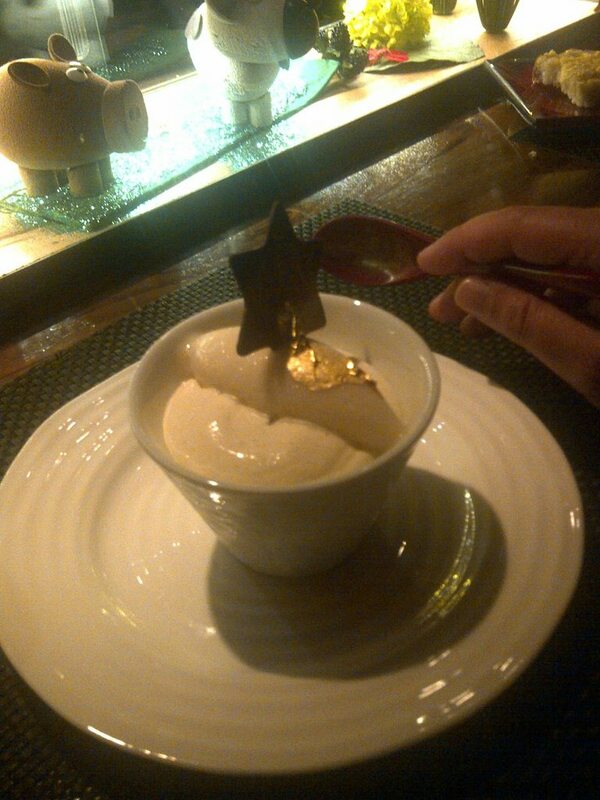 This was preceded by the foie gras dish. 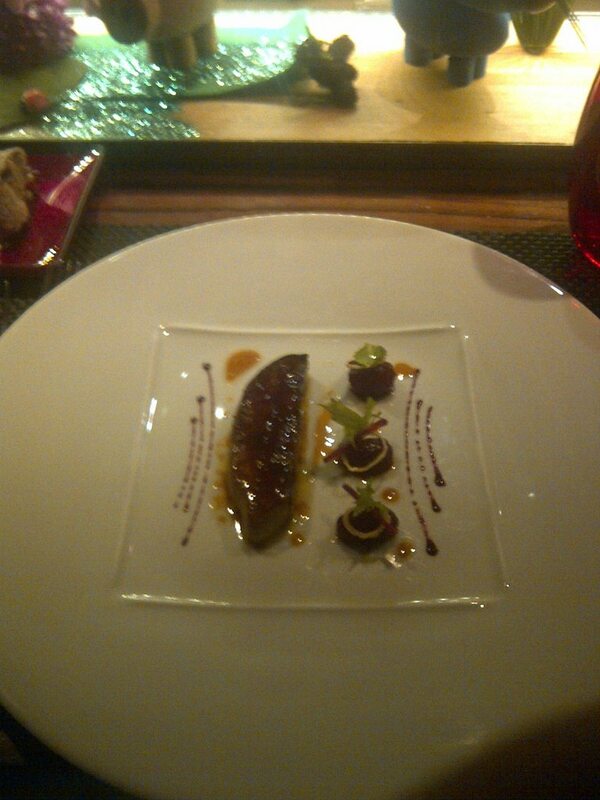 The foie gras was beautifully presented with 3 cherry liqueur soaked muscat grapes with a strip of ginger. The foie gras had caramelised, and its' richness was perfectly complimented with the cherry flavoured grapes and hint of ginger. Chef Oliver Limousin was on duty and we talked about the foie gras, with my brother showering compliments and saying it was the best he had ever had. It came from a small farm near the first restaurant he worked at. He said that whilst they were not the largest foie gras, they were certainly some of the best, and I could only agree. As I struggle with too much foie gras my brother finished my piece off and was exceedingly grateful for the extra mouthful. 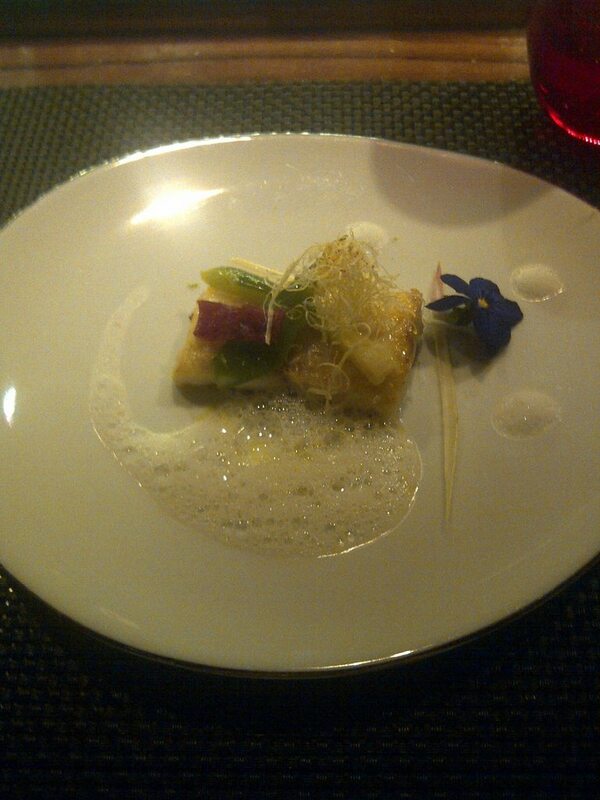 Following this was a fish dish, sea bass with lemon grass and fondue leeks. The fish was very delicate, and matched the aromatic lemon grass foam. The leeks were also of exceptional quality. The main course was the signature dish of caramelised quail stuffed with foie gras, presented with a small amount of dill, and truffle mash topped with a shaving of truffle. I was a bit full by this point, and wish i had the appetite to finish it all off, as the quail was perfectly cooked and utterly delicious, and the truffle was fresh, fragrant and flavoursome. We also were given a portion of the famous Robuchon mash, 50% butter 50% potato, and well deserved of its' legendary status as the best mash about. Even though I was pretty full by this stage, I've never been one for missing pudding. The desserts were the same as I have had previously, and whilst I wanted to try the pear dessert again, my brother isn't keen on pears and was offered a chocolate dessert instead. 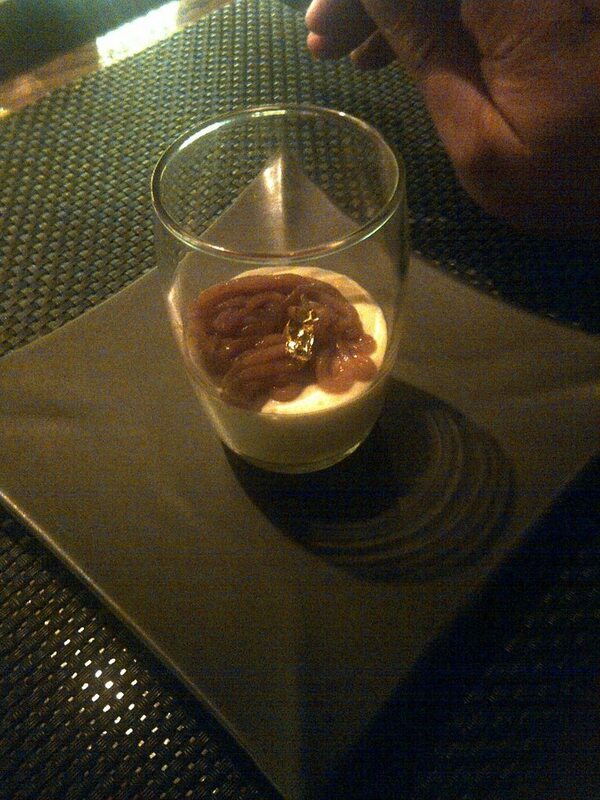 However, first up was a shot glass of vanilla panacotta, topped with chestnut puree and a piece of gold leaf. I love the dish, its' only a few mouthfuls but the combination of creamy panacotta and intense sweet chestnut works really well. I had the pear dessert. This is pears, chocolate mousse, pear mousse and a particularly marvellous pear sorbet. It's not as heavy as it might seem, and the pears were sweet and provided the texture with the chocolate and mousses. My brother had the chocolate dessert, it comes with an attractive presentation, a disc of chocolate is decorated and sits on the dish, with chocolate mousse, sauce and crunchy pieces within. Another winner. Coffee and petit four completed the meal. The petit four were a chocolate, a caramel and an intriguing square of soft meringue. We split the bill, coming to about 160 GBP each. I really enjoy the experience at Robuchon, not only for the food and service, but also in being able to witness zen like calm and group-mind organisation from the 6-7 guys in the kitchen and prep area in front of you. You see all the dishes go out, making you want to try all the dishes on the menu, and the choreography of the chefs as they all come together to assemble a dish is an impressive sight. It was also a pleasure to talk to Chef Limousin about some of the dishes, and he also came out to reception when we left to thank us for eating.